Basic 7: Pâte à choux - Do You Know The Muffin Man? After they were baked and cooled, we dipped the tops of the éclairs in chocolate fondant which Chef had made during the break. I noticed that the tops of the ladyfingers were uneven from the grooves made by the star tip making it hard to get a nice coating. Perhaps a plain tip would be more suitable. 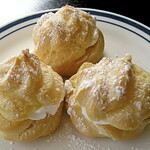 While the fondant was drying, we sliced the top thirds off the cream puffs and piped whipped cream into them. 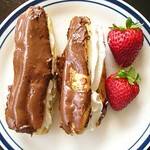 The éclairs were similarly split and filled. Chef showed how to make swans using choux paste that he had piped into shells and swan necks. He filled the bottom half with cream making the body. The top was cut in half lengthwise and the halves inserted into the cream, forming the wings. The thin swan necks were inserted to complete the swan. Our pâte à choux creations were neutral in taste since they were made with shortening and no sugar. I suppose this is to accomodate whatever filling you want since small savoury puffs can be used for canapés. According to Dufflet, profiteroles derive from a French word meaning a small gift. A better explanation is due to Sherry Yard, who says that they cost little to make but yield high margins!